I am an impatient driver. I’m the guy behind you who honks the second the light turns green, fills up your rearview mirror if you are going too slow in the fast lane, and cuts in front of you. At least I was that guy. After a decade living in Miami though, my aggressive driving tendencies were curbed somewhat, pun intended. That’s because in Miami, and in the rest of Florida it now seems, just about everyone is armed to some degree. That fact gives a completely new meaning to the concept of road rage. Aggressive driving turns into gestures behind windows, which escalates into shouting matches, and that sadly in today’s 2nd Amendment world, can now end very badly. My aggressive driving tendencies, while mellowed somewhat by age, are still there, but when a “disagreement” results, I won’t feed the smoldering fire. Instead I will let bygones be bygones, “Que’ Sera’ Sera’”, as Doris Day famously once sang. There are far more worrisome things going on in today’s world than going too slow in the fast lane. When I picture road rage, I have a vision of two cabbies yelling at each other with cigars hanging from their mouths, and their voices thick with a New York accent. Those cabbies are usually mad at each other for something stupid, and as is the case in most road rage incidents, they are most oftentimes much ado about nothing. However, this highlights the other reason for road rage. After all have you seen the cabs those drivers are forced to wheel? Once big boxy yellow behemoths, today’s cabs are small and most often (gag) hybrids. If I was forced to drive one for all those hours in a day, I’d be full of rage too, road and otherwise. That’s why many times, when I have a “disagreement” with a fellow motorist I take pity on them . Especially if I see they are driving a car that I figure probably already has them raging. It’s usually an older model, fogged up headlights, peeling window tint, and the like. Or perhaps they’re in a car that was a mistake. Something that wasn’t researched well. We’ve all done that, I know I have. For me it was a Pontiac Sunbird hatchback in the late 1980s (turbo!). Sure, it looked good on the dealer’s lot, decent test drive, and affordable payments. It didn’t take long however for me to absolutely hate the thing. It was like falling in love with a one-night stand while drunk only to wake up the next morning to see her teeth in a glass on the bathroom sink (I never looked back and even left my shoes). The point is that buying the wrong car can lead to misery on the road, and that can results in an easier trigger during a “disagreement”. That’s why I sometimes feel sorry for people who are angry drivers. I thought of all of this after BMW sent me its newest offering for a week. Because if you have road rage after driving the new 2017 BMW X4, you have some serious anger issues. 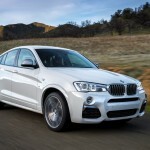 The X4 is one of those rare machines that I really, really, really, liked. 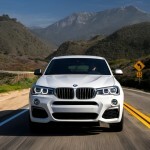 BMW calls it a Sports Activity Coupe, but really it’s a crossover, or a smaller luxury SUV. Think of a 3-series that’s been squashed; more like a Rogue, or its nearest competitors, the Range Rover Evoque and the Porsche Macan. 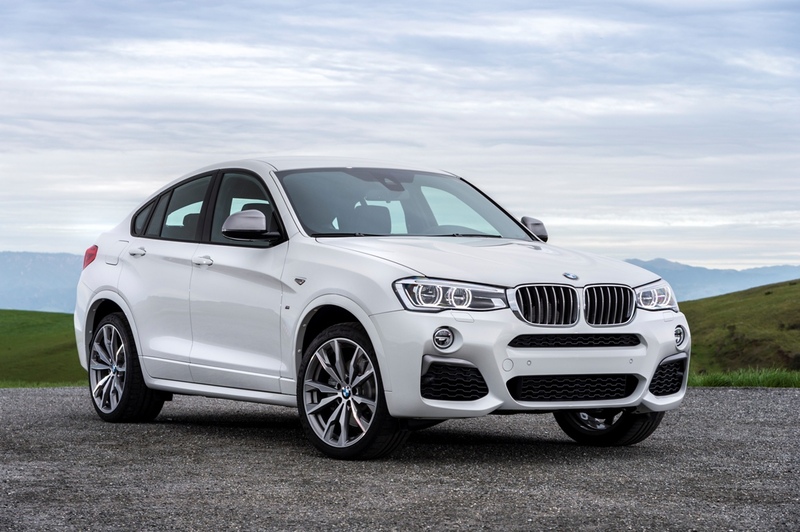 Introduced in 2014, the X4 looks little like its X vehicle brethren. The roofline slopes back in a graceful arc with less of the boxy profile of the other X vehicles. It’s like the X3 became a hatchback. In fact, the X4 shares the same mechanics as the X3. For the 2017 model year, BMW dropped the xDrive35i model on the X4 and replaced it with the M40i, which is the model I had for the week. 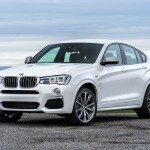 There are two trim levels for the X4. 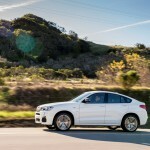 The xDrive28i and M40i. The level determines the engine choice, but both have standard all wheel drive and the sport-tuned eight-speed automatic transmission. 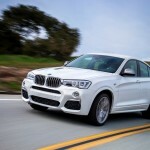 The xDrive28i has a 2.0-liter turbocharged four-cylinder engine with 240 horsepower and 260 pound-feet of torque, the M40i has a 3.0-liter turbocharged inline-6 pumping out 360 hp and 343 lb-ft of torque. 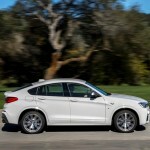 As with all BMWs there are loads of standard features, including automatic adaptive xenon headlights, LED running lights and foglights, adaptive LED taillights, a sunroof, and a power liftgate as well as rear parking sensors. There’s also eight-way power front seats with driver memory settings, dual-zone automatic climate control, “SensaTec” premium vinyl upholstery, a leather-wrapped steering wheel, paddle shifters, and a 40/20/40-split folding rear seat. Tech wise there’s Bluetooth, BMW Assist emergency telematics, the iDrive electronics interface and a nine-speaker sound system with a CD player, HD radio, USB port and an auxiliary audio jack. Optional packages for the xDrive28i include the Premium package that adds a hands free liftgate, keyless entry and ignition, full leather upholstery, power lumbar adjustments for the front seats, and a satellite radio. 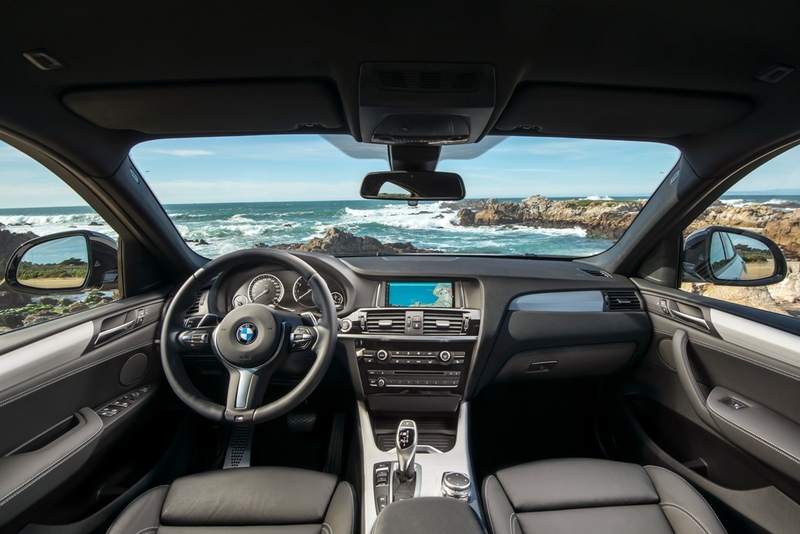 The M Sport package moves the 18-inch wheels up to 19-inch sport alloy wheels (you can upgrade those to 20-inch) and adds a sport steering wheel, front sport seats and trim add-ons including a body kit. The M40i includes the more powerful engine and front parking sensors and the M Sport and Premium package contents standard. The rearview camera is available as a stand-alone option. Several option packages can be had with each level. 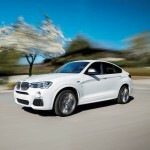 The Cold Weather package adds a heated steering wheel, heated front and rear seats, and retractable headlight washers. The Driver Assistance package adds several collision avoidance tech features, and the Lighting package gives you full LED headlights with automatic high beams. The Technology package adds a larger central iDrive screen, and upgrades the iDrive controller. It also adds navigation, enhances the driver information display in the gauge cluster, and adds a heads up display. 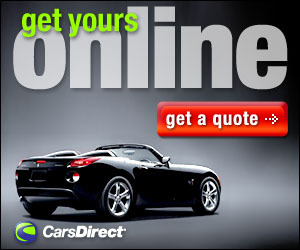 There’s also smartphone-app integration and BMW Remote Services. One of the many advantages an SUV or even most crossover have is a higher view of the road. 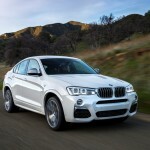 The X4 has that yet it drives like a coupe. 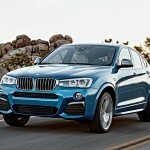 The 360 horses and 343 lb-ft of torque launch the X4 off the line with a 0-60 time of 4.7 seconds. “This is an SUV?” I kept thinking. 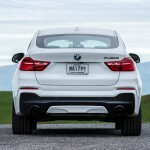 The beauty of the X4 is that it drives like a coupe but gives the view of an SUV. 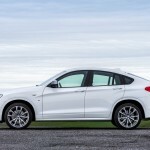 The design leads to a bit of a small backseat, but if you treat the X4 as the vehicle it is, this, in my opinion, isn’t an issue. 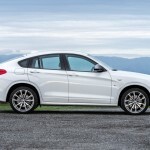 What the X4 is is a coupe with the higher stance of an SUV, with just a bit more room than a regular coupe. 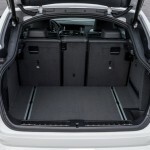 It offers more space than a regular coupe, with the lofty view drivers like from an SUV. When unleashed, the X4 M40i explodes off the line. And the noise, the noise, the noise. That beautiful symphony emitted from the back, and carried over into the cabin that lets you know you are indeed driving something special. 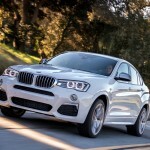 The X4 is a crossover that acts like a coupe, with the extra room and view drivers like. If you have any sort of road rage while tooling around in an X4, you should probably schedule some time with a mental health professional. After my week with it, I was left with a smile on my face. 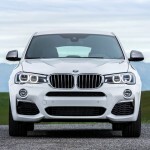 If you are looking in the SUV/crossover category, an X4 will no doubt leave a smile on your face as well. Base Curb Weight: 4235 lbs.